Most organizations require certain employees to travel on business. 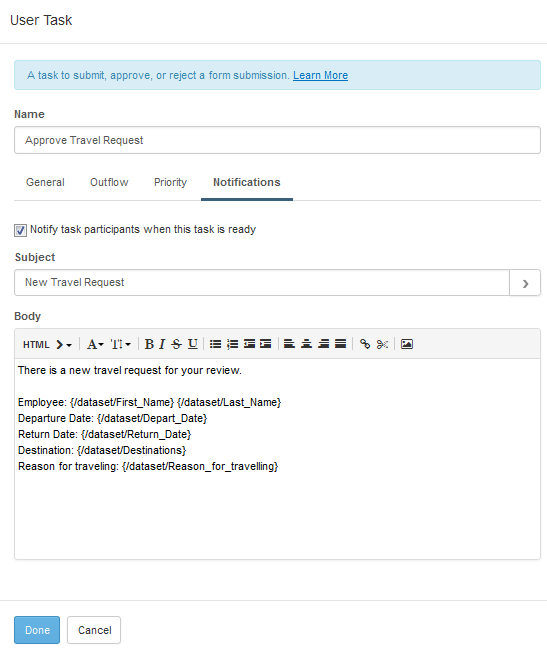 Learn how to streamline and expedite the travel request process using Laserfiche Forms. 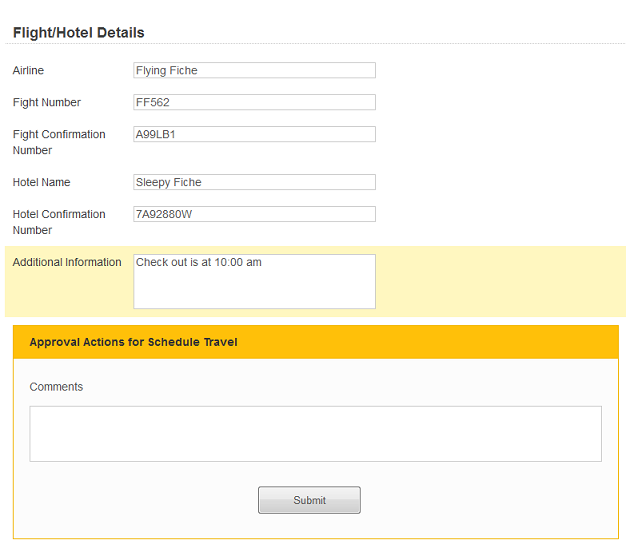 The employee initiates the travel request by logging into the electronic “Travel Request Form” in her browser. She fills out the required information, including “Name” and “Department.” Certain departments have conditional rules applied to them. If the employee selects “Sales,” for example, a “Reason for traveling” field appears. After filling in the requested information, the employee clicks “Submit” to submit the form. After the employee submits the form, a PDF copy of the form is saved in the Laserfiche repository. The manager receives an email notification letting her know that the form is ready to review in Laserfiche Forms. 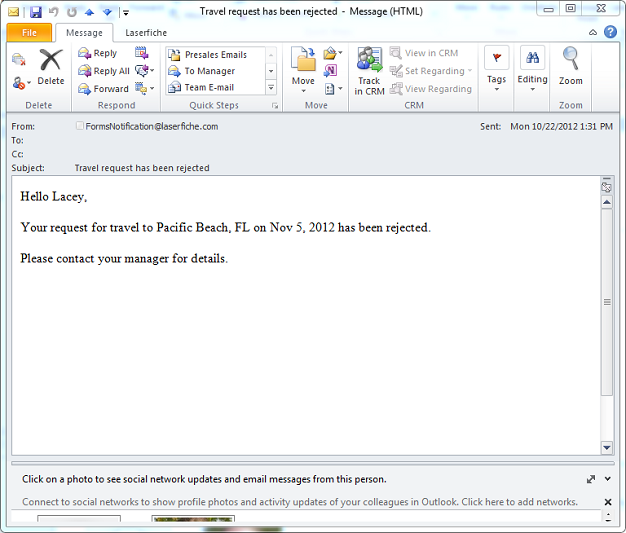 The manager can also approve the travel request without opening Laserfiche Forms by replying to the email with either “Approve” or “Reject” in the body of the message. 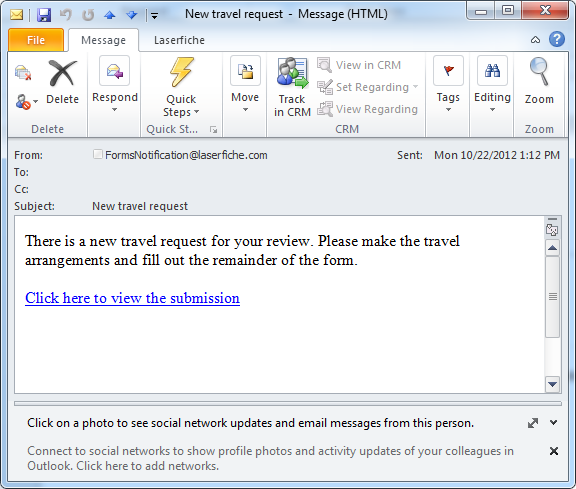 If the request is approved, the travel coordinator receives an email notification that contains a link to the form. 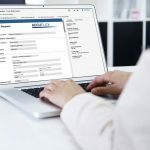 Clicking the link takes the travel coordinator directly to a special, read-only version of the approved form that has an additional section for flight and hotel information. 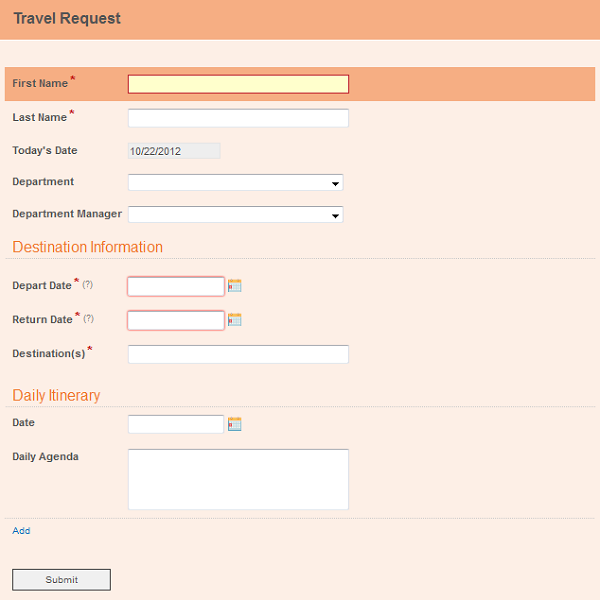 After making the travel arrangements, the travel coordinator fills in this section and submits the form. 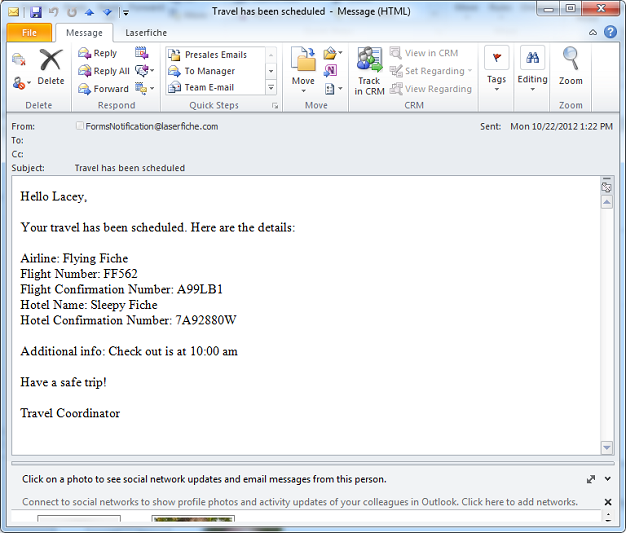 This generates an email to the employee with the flight and hotel information. If the request has been rejected, an email is sent to the employee notifying her of the rejection and asking her to contact her manager for more details. Laserfiche Forms integrates with Laserfiche Workflow to make this process smooth and transparent to everyone involved. There are two types of tasks used in this process: user tasks and service tasks. 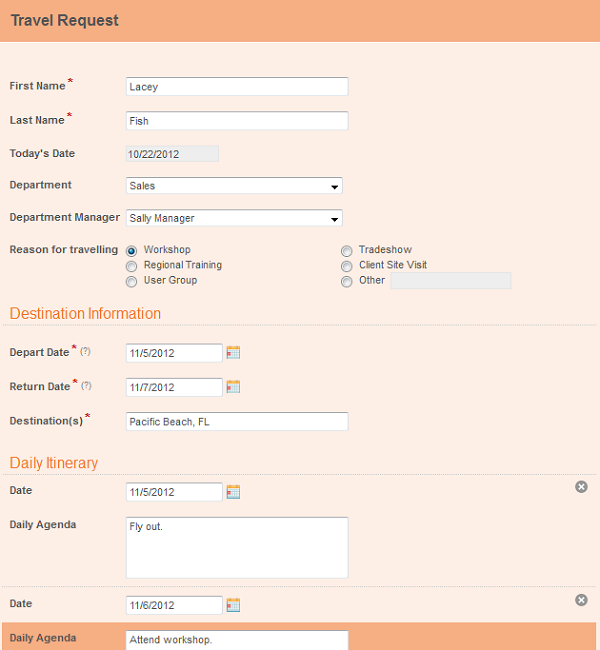 User tasks, such as “Fill Out Travel Request” and “Schedule Travel” are tasks performed by people. Service tasks, such as “Email Travel Info” and “Save to Approved Folder” are tasks performed by services or web applications. 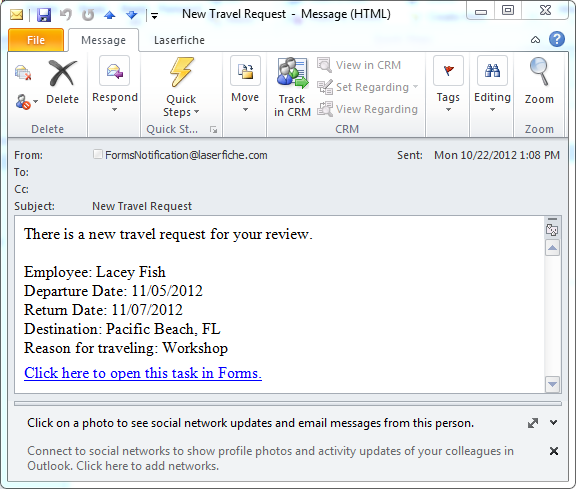 The manager can approve the travel request by email. 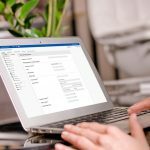 The Email Approval Server must be specified on the Laserfiche Forms Configuration page in order to allow direct approvals. This option must be enabled individually for each user task by selecting the “Allow direct approval” checkbox in the user task configuration dialog box. If the application form was approved and travel scheduled, the form is sent to the Laserfiche repository for storage. 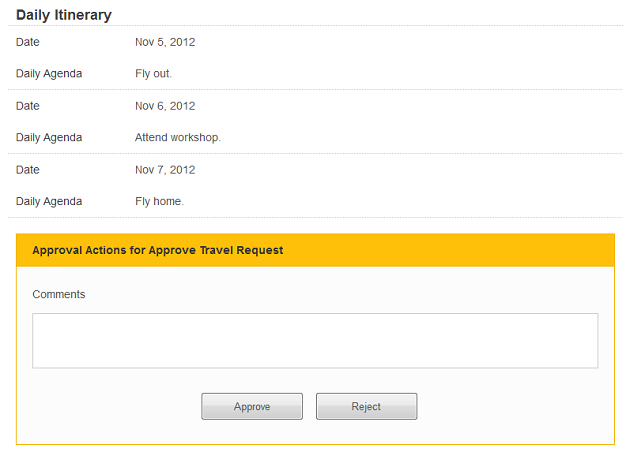 Approved forms are stored in the “Approved Travel Requests” folder; rejected forms are sent to the “Rejected Travel Requests” folder. It is easy to configure where the form will be saved in the Laserfiche repository using the Save to Repository service task. 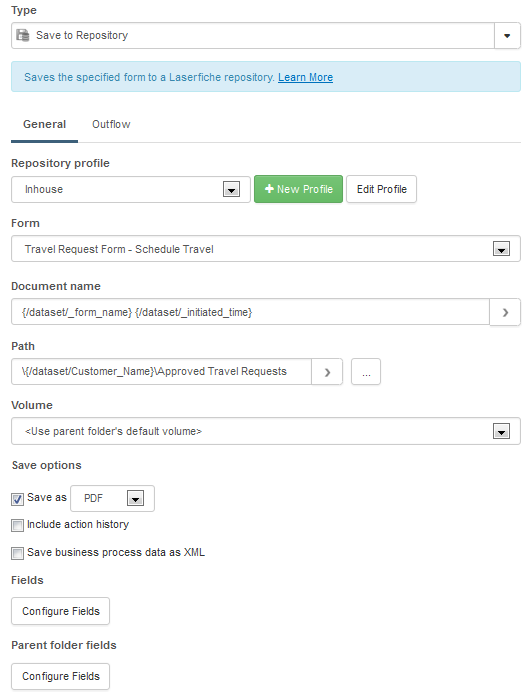 This task also allows the user to specify the template and fields that will be appended to the submission in Laserfiche. There are two different Save to Repository service tasks used in this travel request process: one to route approved travel requests and one to route rejected ones. Implement completely paperless business processes from start to finish. Efficiently capture input from multiple people on the same form, resulting in a much faster approval process. Make capture an integrated component of the business process, allowing the form to be auditable from the moment it is created. 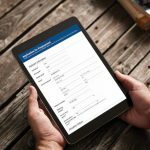 Get the complete guide to Laserfiche Forms and see how electronic forms have helped other organizations get rid of paper and inefficiency.